Once again we enjoyed a good turnout of volunteers to tackle the projects needing attention. We were fortunate that the day didn't turn out to be nearly as hot as we had expected. There were several projects awaiting attention; the restoration of the two Thomas Morse Scouts, the Rearwin Sportster's ASI issues, rigging the Canuck, getting the Triplane's rotary engine running plus issues with the Indian Motorbike, and various Model T improvements to be made along with fixing the bed back on the TT. Tom Miller reports that great progress was made on the Scouts… well, T-1 anyway! Steve Freeman had inspected the T-1 belly former and realized that there was an inwards dip in the stringers one station behind the lower wings. Steve asked that this be rectified as this was not as it should be, though Ron Marcotte had ensured the T-1 belly former was reassembled exactly as it was when it was removed from the airplane. So Ron and Don Ralston set about figuring out a way to eliminate the inwards dip without having to disassemble the belly former. They had that conquered before lunch, at which point Ron had to depart for a family gathering. Steve Freeman and Tom Miller cleaned and checked over the T-2 belly formers and wrapped the unit in plastic to be re-varnished next time. Kevin Monahan spent most of his day working on the final disassembly and clean-up of the T-1 main gear. He was successful in disassembling the gear down as far as Steve was willing to with it (the only step we are not going to do is remove the strut wrapping and the wood trailing edge underneath). The wood spreader bars went home with Tom Gaylord to be cleaned, stripped, and re-varnished. Kevin spent some time with cleaners working on the exposed steel fittings on the gear legs and also put some of the smaller brackets in the sand blaster to clean them up. Steve Richardson spent part of his day collecting the instrument panels and such from both Tommies. 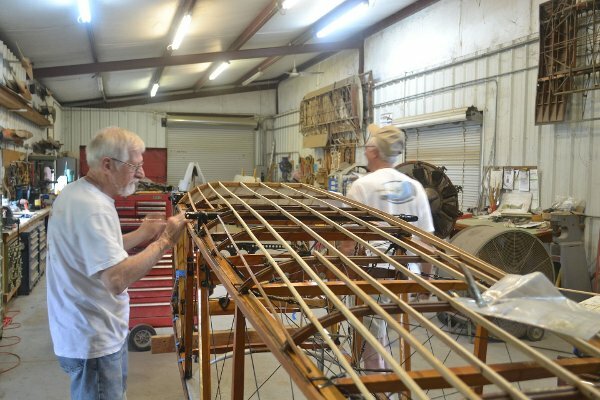 Steve took the instruments to see about getting them checked and refurbished if necessary, while the wood components (various instrument panels and cockpit floorboards) were parceled out to various volunteers to be stripped and re-varnished at home. Dave Miller ended up with a few parts, and Steve Richardson may have taken some home as well. Steve Freeman and Tom Miller also yanked the rotary engine out of T-2, so its main gear can be removed and stripped for finishing. The engines for both Tommies need to be refurbished before going back into the airplanes. Steve Richardson brought back a box of Tommy metal parts he'd taken home to clean and refinish. These were placed into the Tommy parts drawers. Steve had mainly worked on cables and control horns plus some other metal flotsam and jetsam from the Tommies. The Rearwin was pulled from the hangar and brought over to the shop overhang to have the ASI issues addressed, but we never got around to it due to lack of personnel. People were engaged in the library relocation, fixing Piper Cub tires and Model T repair! In pulling the Cub out of the LLC hangar so we could get a forklift in to transfer the pallets with the library's book boxes to their new location the folks pulling the airplane realized it had flat tires. Steve asked if the brand new tires could be mounted so various volunteers jumped onto that, including Billy Cheshire and Art Wilson. 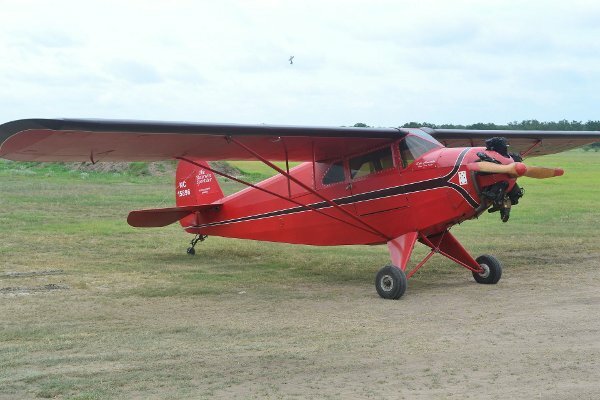 Before the end of the day the wheels and tires had been removed from the aircraft, broken down, new tires installed, and everything put back onto the Cub! And everything seemed to be holding air! I didn't ask how many tubes were pinched in the process, but Billy and Art know a thing or three about this work, so they may have gotten both tires mounted and inflated the first time! No one has been happy with the library being boxed up and stored in the LLC hangar. Diane Edgerly and Tammy Orloff have volunteered to sort and catalogue the library collection if it got relocated, and we received word that the library should be moved to a climate controlled environment. So the airplanes were pulled from the LLC hangar (see Piper Cub above!) and Terry Bledsoe transferred the pallets of books to the shop office door, with an assist from Laser Alan. Terry then spent much of the remainder of his day re-organizing the LLC hangar. Dave Edgerly and Dave Orloff, plus some help from Bill and Will Walsh, humped boxes of books into the Shop apartment, and dealt with the small mountain of cardboard created as the book boxes were unloaded. Also, the two Dave's had to get the bookshelves down from the Shop attic and clean them up some. Probably 90% of the book boxes were unloaded and put onto the shelves, but all the book boxes are now in a climate controlled environment, and I know we can all breathe easier now that that valuable resource is better protected. The actual cataloging of the library will start next workday! No work was done on either of these two projects. The Canuck is on hold for a full weekend of work (Steve needed to blast out of Kingsbury on Sunday as he needed to get home to prepare for Oshkosh), and there was no knowledgeable manpower to tackle the Triplane's motor. Al Sumrall reports that much progress was made in the Team vehicles camp during the workday. The most significant progress was getting the bed properly bolted onto the TT! This effort was largely down to John Bush, once a party of volunteers had lifted the bed, turned it over and placed it onto the TT! 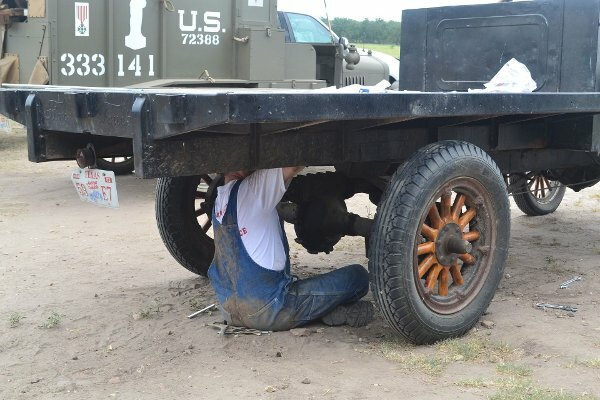 John spent a lot of time in the shade of the bed drilling holes and fastening the bed onto the truck's frame. Al was delegated to make a parts run to a local hardware store for the nuts, bolts and washers. The U.S. Ambulance had a suspension part fall off at some point while being operated, but Cameron and David Whitaker located a replacement and got it installed. David and his sons continued their work on the Indian but progress was negligible. They did make some headway in upgrading the Triumph's fuel system though! Mark H., a custom leatherworker, has agreed to recover the Indian's seat and spent some time with Al talking about leather care and preservation. Team Vehicles dined at Edna's for lunch and traveled to the restaurant via Triumph motorbike, Model T French Ambulance, and Model T Okie Wrecker. All vehicles made it back safe and sound and there were no stories about breakdowns and bubblegum & duct tape roadside repairs so that sounds like real progress! !